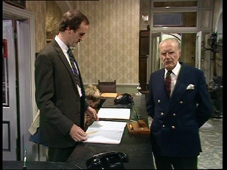 The Germans are coming to stay at Fawlty Towers and Basil is running the Hotel solo with Sybil laid up in hospital suffering an ingrown toenail. 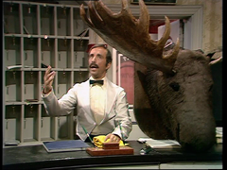 Basil has to hang up a moose head in the foyer and prepare for a fire drill the next morning. 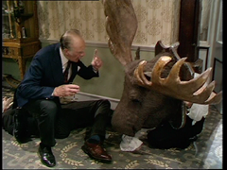 The moose head falls down every time Basil hangs it up and to complicate matters Sybil keeps calling him with reminders every five minutes. 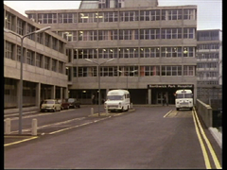 Despite Polly reporting minor problems to Sybil, the fire drill goes ahead as planned, Basil argues with the guests over what the fire drill bell and alarm bells sound like and gets Manuel to start cooking lunch. Unfortunately Manuel starts an actual fire in the kitchen and when Basil attempts to use the fire extinguisher it explodes in his face and a further knock with a frying pan puts him in hospital with concussion. After Sybil has visited him, a concussed Basil sneaks out of hospital back to the hotel just as the party of Germans arrive. The concussion worsens Basil's manners and he is constantly insulting the Germans by innocently mentioning the war and reducing a girl to tears with his Hitler impressions.Polly sends for the doctor but the damage has already been done with the Germans upset by Basil's World War 2 references. Luckily the moose falls down once more and knocks him out. Ze Germans! Yes a lot has been said about the Germans and I don't intend to say a lot more. 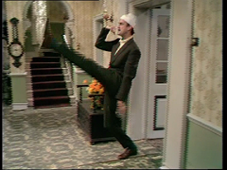 It's by far the most popular Fawlty Towers episode. You can tell that by the BBC DVD adverts for any BBC product always feature the bit with the bandaged headed Basil doing his Hitler impression and funny walk. Even if it's coming back on the ABC for repeats this is the one bit always used to advertise the show. But how much potential harm as it done for the casual viewer or someone who hasn's seen it? 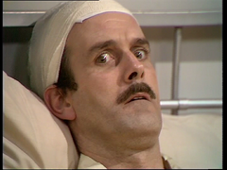 You'd think from this clip Fawlty Towers was about an insane asylum...hmmm not far off anyway. Still as popular as this episdoe is I don't think it's the best, that honour lies with Communication Problems. However it's one the best and has some unbelievably funny set pieces. So it's amazing the focus for the episode is where the concussed Basil escapes from the hospital and comes back to insult everyone. That's only the last five minutes! The Set pieces are great! Basil's stand off with the other guests over what the fire drill bell and alarm bell sounds like and whether the drill has started are painfully funny. As is the close to dementia Major's reaction when he thinks a disembodied Mosse head is talking to him, Manuel's faux English voice from beneath the front desk suits the Mosse head perfectly. Ballad Berkerly's Major really gets his chance to shine in this one maybe this is why his bits are more prominent in season two? 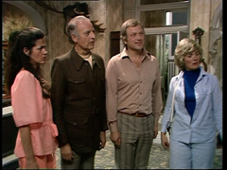 Prunella Scales is sidelined for this episode but she still makes her presence felt with her a couple of scenes chock full of scathing witticisms of Basil's running of the hotel without her. Imagine if she had heart surgery the hotel would fall to bits with Basil's sole management. Thing is it seems in some instances he can cope...just not with guests. Still it has some of the funniest lines ever "Don't why we bother we should let you all burn" or Don't touch me I don;t know where you've been are delivered with such precise comic timing you can see there was never a chance of John Cleese's Basil not becoming an iconic TV character.